This is the timeline of my journey with cancer. I found a lump in right breast from a monthly self check. I went to primary doctor who immediately ordered a mammo, ultrasound and biopsy. I was diagnosed with Invasive Ductal Carcinoma, ER+/PR+/Her2-. Grade 2. Met with surgeon, who suggested that because of the size of the tumor (suggested 5-6 cm) and where it was located, that I was to undergo chemo first, to shrink tumor in order to get clear margins. I was also given a series of tests, to determine if the cancer had spread anywhere else in my body, these tests included; a bone scan, MRI’s and a PET CT.
Met with oncologist and was immediately given my treatment plan. It included: 4 rounds of chemo – Adriamycin/Cytocin, bi lateral mastectomy, 4 rounds of Taxol and 6 weeks of radiation. 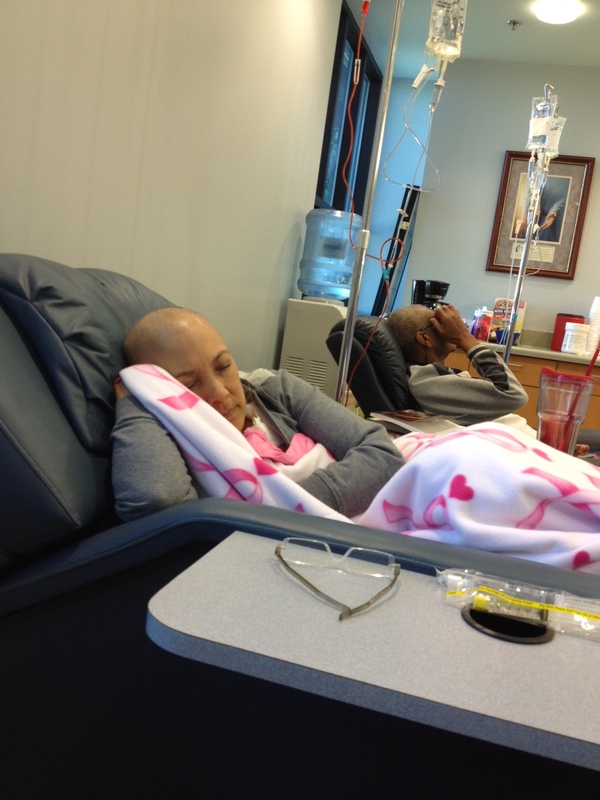 First chemo scheduled to start on December 17th, 2012. Results of PET CT scan in and there were found suspicious “hot spots” of metasisis in right acromion and in left femur . First round of chemo started. Chemo continued. Side effects included; extreme nausea, fatigue, bone aches, and low blood counts which resulted in daily shots for neutropenia. Bed ridden. I would wake up in the middle of the night gasping for breath. Bone Biopsy scheduled to determine if the hot spot in my shoulder was in deed cancerous. Port A Cath inserted for future chemo treatments. Chemo continued: Side effects intensified. Extreme nausea, fatigue, bone aches, dehydration, and extreme low blood counts which resulted in daily shots for neutropenia and hydration IV’S. Totally bedridden for a week after each treatment. Day before bone biopsy, the hospital called and cancelled the procedure, stating it was too risky and they were not willing to do it. Oncologist referred my case to an ortho surgeon. He wouldn’t do it either. Stating that they would either cause permanent nerve damage or mobility of my arm. Ortho surgeon referred my case to a specialist at Cedar Sinai, Dr. Menendez. 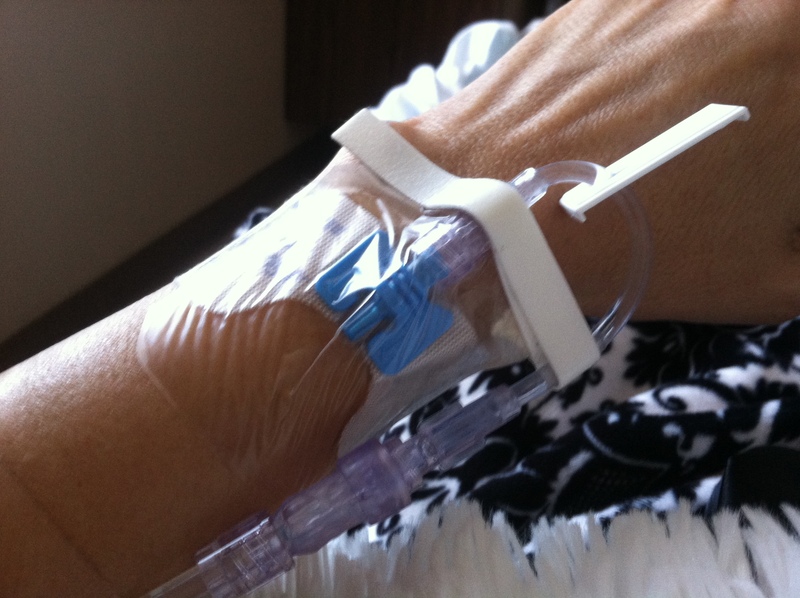 On March 5th, I was admitted into the hospital, with sepsis. The portacath site was infected. We (my husband and I) specifically asked for the portacath to be removed. However, doctors (including oncologist, attending and infectious disease doctors) all wanted to save the port a cath because of the future chemo treatments I would need. I was in the hospital for 5 days, on 24 hours antibiotics, had a pic line inserted and sent home to be on vancomycin 24 hours a day for two weeks. Discharged on March 8th. In home health care was discharged to my home to help with the vanco troughs and administration of the meds. I was readmitted into the hospital,on March 12th, in full blown sepsis again. This time it was life threatening. My husband ordered the port a cath to be taken out immediately. I was again put on a series of antibiotics 24 hours a day. Port A Cath was removed 24 hours later from when I was admitted into hospital. My symptoms did not improve. I was suffering from neutropenia also at the time, high fevers, low blood pressure, and was put into a room, with a woman who had just come off of the plane from India which we found out was a carrier of MRSA. I was with her for almost 48 hours. When the staff realized I was in jeopardy, they moved me to another room, and because of a close doctor friend, convinced the attending to keep me isolated from other patients. My sepsis symptoms did not improve once the port a cath was removed, and after another 3 days of high fevers, vomiting, chills, falling blood pressure, etc, my husband yelling and asking why someone wasn’t doing anything to help, they removed my pic line as well. When the pic line was removed, all of my veins collapsed. And nursing staff had a very hard time finding a workable vein to insert another IV, for continued antibiotic infusion. Symptoms improved, and I was discharged on March 18th with IV and more antibiotics to be given this time for a month. 24 hours a day. In home health care came once again to set up IV’s, etc. My veins continued to collapse and for 48 hours after my release from hospital, home health care had to continually come out to find new veins. It was emotionally taxing as well as painful. I finally stopped it and asked to be put on an oral med. I was, and had a full blown reaction to that med. Swelling of the face and a rash that covered my entire body, head to toe. I stopped that medication as well. I felt at this point, it was not the cancer that was killing me it was the treatment plan that the doctors set forth, and yet, the oncologist wanted me to start another round of chemo, (Taxol) as soon as possible. No one was listening to my concerns about this all just did not seem right. I told my oncologist that I would not go back into chemo. I demanded to be put on Tamoxifen. Consulted with Dr. Larry Menendez at Cedar Sinai Medical Center in regards to the hot spot in my shoulder. He agreed to biopsy it and after hearing about my ordeal with sepsis, he was the first one to suggest that I get a second opinion on how I was being treated, as I was still dealing with the after effects of the antiobiotics. Rash and swelling. He personally suggested Dr. Christy Russell at USC Norris and called her directly from the exam room where we were seeing him. Biopsy scheduled for May 3rd at USC Keck Hospital. Met with my current oncologist and told her what I was doing. That I was choosing to go with my second opinion. She understood. Started endocrine therapy of tamoxifen. Biopsy of acromion at USC Keck. Initial frozen section found to be negative, but pathology reports then come back that it was indeed cancer. I have now been diagnosed with Stage 4 metastatic breast cancer. Dr. Russell and Dr. Sener both agreed that I needed to get the tumor out asap, and not to wait, and also suggested a lumpectomy to save the breast instead of a radical bilateral mastectomy and shared with my husband and I, the scientific evidence of lumpectomy vs mastectomy. Both doctors, were thorough, to the point but also respecting of me and made sure that they left no question unanswered. When I asked Dr. Russell about further chemo she said she didnt agree with that course of treatment right now, but she did suggest radiation for my shoulder. While she was surprised that my first oncologist put me on tamoxifen upon my request….she also said, she agreed with the decision though it was not standard. Lumpectomy was a success. The incision that was made was 6 inches long, and yet after only 3 weeks of surgery, the scarring is predominately less than the scarring of the port a cath site. Pathology reports came back that all margins were clear and I was cancer free in the breast area. Follow up appointment with Dr. Sener- he suggested radiation to the breast to make sure we knock out all possibilities of cancer returning and back to Dr. Russell for her suggestion with radiation to the shoulder. I started 6 weeks of radiation to the breast area and an additional 2 weeks of radiation to my shoulder to see if we could obliterate the active cancer in the acromion. Radiation burns were severe. Third degree burns covered most of the right side clavicle area. After allowing a good 6 months of healing to occur from lumpectomy and radiation, doctors scheduled another PET CT. The findings came back that the cancer was still there but not active. In January of 2015, I decided to start taking my life back and began hiking. My goal for the year was to train for 8 months and summit Mt. Whitney. The side effects of Tamoxifen were taking a toll on me both physically and mentally and in July I met with my oncologist and told her I wanted to stop treatment until after my big climb. Met with oncologist and started new aromatase inhibitor called Letrozole. Side effects have been minimal with fatigue being the worst. Taking 5000iu of D3 daily to help. I also changed my diet to an almost all plant based diet. I do though eat seafood. My last PET CT and blood work were done before we moved to Oregon, and I continue to be NED. Hoping to be one of the extreme survivors of MBC….an outlier. Thank you for responding back on Instagram! I can not believe what you have been through with your cancer treatment. I have often thought I was relatively “lucky” because my cancer responds better to oral chemo than standard chemo and reading your story makes me think I’m right. 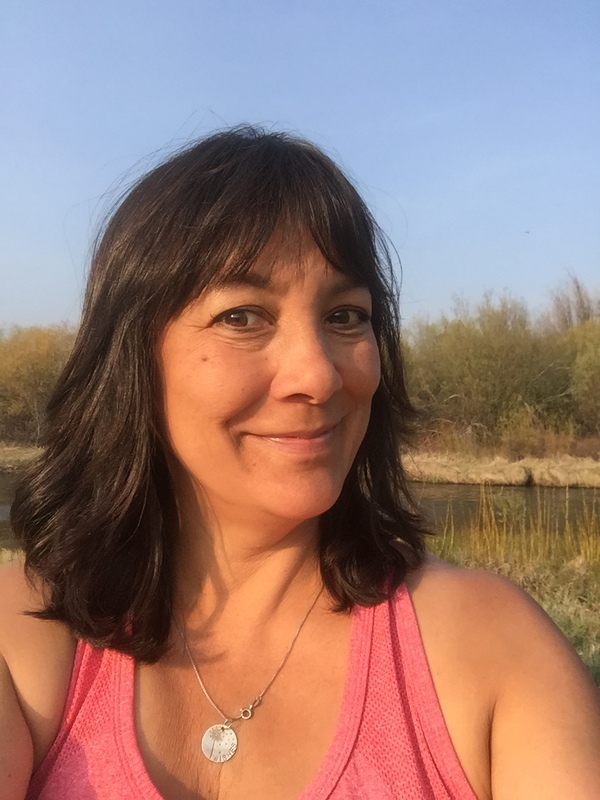 Im so glad I found you on Instagram, for the most part my life hasnt changed but sometimes the changes I have made, daily pills, sleeplessness menopause, pretty strict diet, no drinking , they hit me and I miss my old life. Reading your blog and Instagram reminds me that I didn’t ever have a guarantee of anything and that I still don’t know what will happen! Wow, so glad to have found your blog. I was Dx November 2012 IDC stage 3. 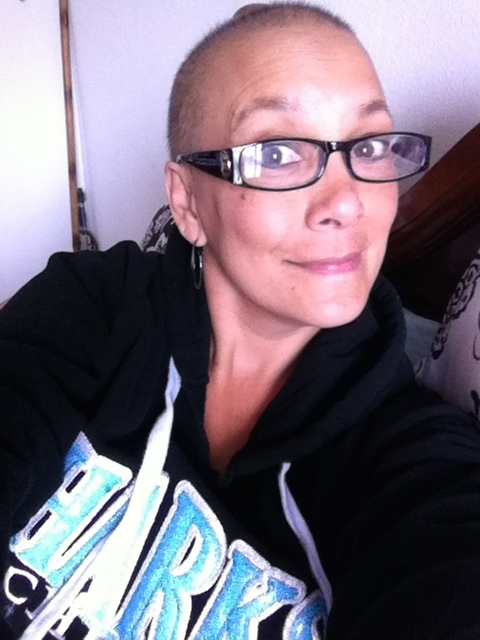 I had bilateral mastectomy plus 27 lymphnodes removed and did the T.A.C. Chemo Cocktail plus the neulasta injection post infusions. I have a medi port in my arm… trying to keep it, as veins are shot. Reconstruction…1st attempt failure….still waiting for 2nd attempt. 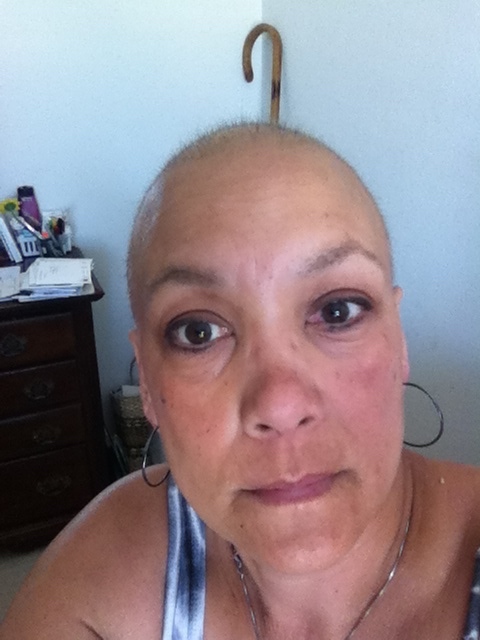 Living life and still trying for a pet scan…my onco….says no. Regardless of the diagnosis, staging and being told that I am considered chronic….. I have really enjoyed your blog/writing…your realistic positivity! I, like you never did the ‘Bucket List’ thing….I just try to live with grace and faith. I feel as though I will go where my feet lead…no stress! Thank you again! A shout out to you from another oligo-metastatic BC survivor. Nice to find your writings! I can relate! Feel I am in an odd survivor category. Diagnosed in Nov. 2014 with IV Oligo-metastatic inflammatory breast cancer IBC – and told of it the day of my first chemo treatment. (IBC =rare, aggressive, deadly). The diagnosis weighed heavily on me. Treated aggressively with 16 chemos (ACT), a masectomy + 4 lymph nodes, 30 radiation treatments, plus one stereotactic radiation treatment to a bone met. I am still here and so thankful my doctors took a chance on me . Now cancer free and hope to stay that way! Check-ups and PET scans are nerve- wracking! But – This spring I will see my son graduate from high school and one of my daughters graduate from college and get married. Sooo grateful. Hi Judi. thank you so much for stopping by my blog and for leaving a comment. You got that right about PET Scans and after numerous one, it still unnerves me. I have one due this month. Yuck. Congratulations on seeing your son and daughter graduations. We dont take these moments for granted anymore do we?? Take care.